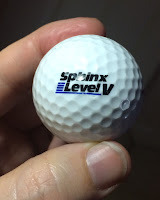 Look what I found in an old golf bag in the garage! If you remember where this ball was used let me know! One of the first balls we branded for an event in 1992! We also do all kinds of other branded merchandise too - from pens to fans to umbrellas and mugs - virtually anything can be branded nowadays. So just give us a call on 01332 291141.